Many women have a large forehead secondary to a congenitally high hairline . An excessively high forehead can be due to genetic factors, hair loss, or from prior surgery such as a coronal brow lift or rarely an endoscopic brow lift. A high hairline or excessively high forehead can make an individual feel very self conscious and limit which hairstyles to wear to help camouflage the large forehead. Our hairline lowering procedure has been developed to lower that hairline and bring the proportions of the face into balance. Forehead reduction surgery can be used to reduce an excessively high hairline in both men and women. - The incision is made just inside the hairline, in an irregular fashion, to avoid a straight scar. 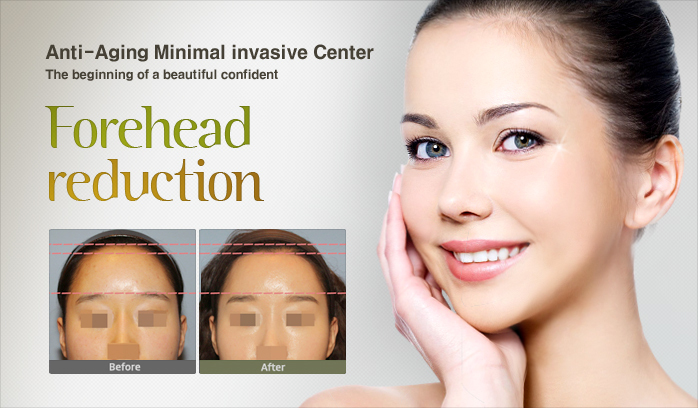 - A resection of forehead skin at the hairline is removed. - The scalp will be mobilized to the back of the head and pulled forward as much as needed. Normally 1.5 -2 cm of advancement is no problem. - The scalp is fixed to the bone using Endotines to prevent it from pulling back.